HTC's got a super-tight relationship with Qualcomm, a relationship that they've gone to the mat to defend on many occasions -- most recently with the Hero, which uses essentially the same 528MHz MSM7201a chipset as pretty much every other notable HTC in recent memory. 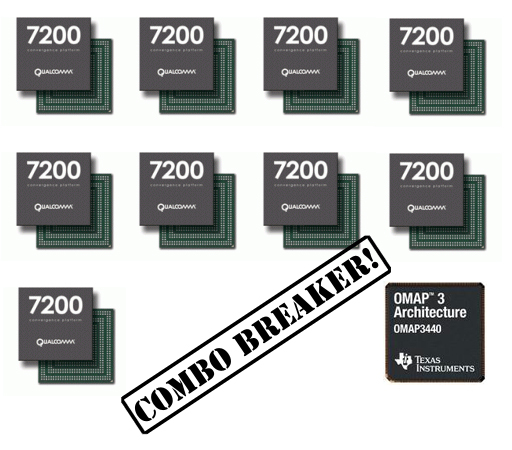 Thing is, this is 2009 and there now are better, faster processors out there, even within the ARM family; take TI's Cortex A8-based OMAP3, for example, which very effectively powers some of the most media-centric, UI eye candy-heavy devices on the market. That's not to say that the MSM7200 series can't hold its own -- one look at TouchFLO 3D gliding along smoothly on a Touch Pro2 will tell you that -- but why not throw more horsepower under the hood if you can still get a full days' worth of use on battery power? We've been able to confirm a wmpoweruser.com report that HTC's upcoming Qilin for China Mobile will be underpinned by an honest-to-goodness OMAP3, which you'd think might rock the Qualcomm boat but HTC's decision was actually very easy: the fully-integrated MSM7200 isn't available in a TD-SCDMA configuration. That's good for Qilin, good for China Mobile, bad for customers of every other Whitestone variant in the world. If there's a silver lining here, it's that HTC's leaked roadmaps seem to indicate that Snapdragon-powered gear will happen sooner rather than later, but at this point, it can't happen soon enough. Confirmed: HTC Qilin uses OMAP3 -- out of necessity originally appeared on Engadget Mobile on Thu, 27 Aug 2009 12:40:00 EST. Please see our terms for use of feeds.